Ashley Sloboda | The Journal Gazette Dr. Rudy Kachmann, far right, engages in discussion Sunday during a health care forum hosted by Hoosiers for a Commonsense Health Plan. Dr. Jon Walker didn't pressure his audience of about two dozen Sunday to agree with his case for a single-payer health care system, also known as Medicare for all. “You don't have to accept this,” he said. He did, however, encourage those at the Allen County Public Library meeting room to research the topic. He and others said they want the single-payer model to be considered. 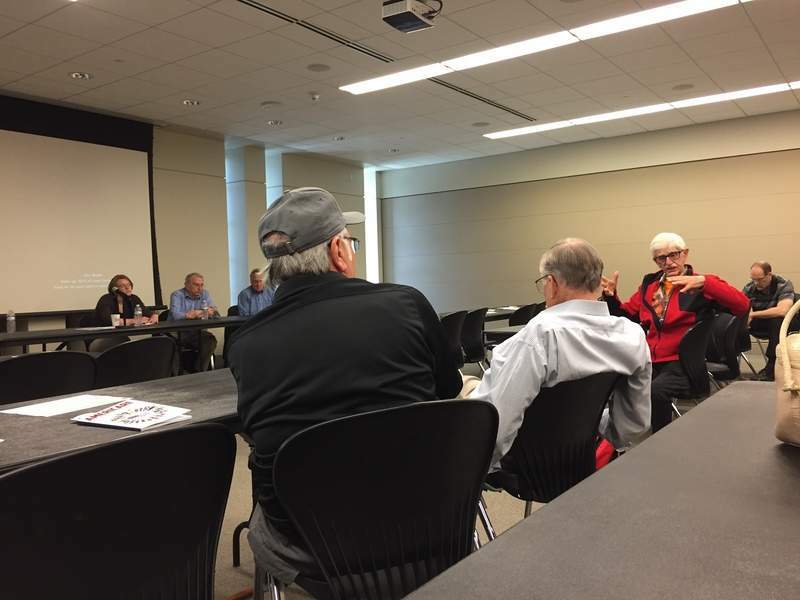 “What we want is a discussion,” said Dr. Alison Case, who joined Walker as a panelist during a forum sponsored by Hoosiers for a Commonsense Health Plan. The group is the Indiana affiliate of Physicians for a National Health Program, a nonprofit research and education organization of 19,000 physicians, medical students and health professionals who support single-payer national health insurance. Under a single-payer system, a single public or quasi-public agency organizes health care financing, but the delivery of care remains largely in private hands, according to the national nonprofit. The organization expects benefits would include the elimination of financial barriers to care, such as deductibles. All were welcome at Sunday's forum, but many attendees indicated they work in health care. Multiple speakers said the existing system is too expensive and, among other problems, leaves many underinsured or uninsured, resulting in people suffering and dying from illnesses they shouldn't be suffering or dying from. “This is a loss to our entire nation,” said Elaine Fazzaro, a retired registered nurse involved with Hoosiers for a Commonsense Health Plan. As a physician, Case said, it's frustrating that costs prevent patients from following treatment plans, such as people with diabetes not taking insulin because it's unaffordable. Panelist Dr. Tom Hayhurst recalled a 41-year-old man whose economic gamble cost him his life. Instead of immediately seeking medical treatment, financial reasons prompted the married father to wait until his temperature reached 104 degrees and he was gasping for air. By then, doctors couldn't cure his pneumonia, Hayhurst said, calling the man's death preventable. Some attendees doubted the country will implement a single-payer system. “Don't give up. Let's go to Washington,” Edith Kenna of the state organization said to a skeptical attendee. Fazzaro agreed that it's important to put pressure on lawmakers.